Two of my favorite warm weather drinks, which are enjoyed all across the Caribbean, are iced “Bush Tea” and Jamaica drink. In the US Virgin Islands, bush tea is any combination of local herbs, but in my experience, almost always is made mainly of lemongrass. Jamaica, or hibiscus, flowers also make a tart tea that is so delicious (and that most people have probably had before if they’ve had any “zinger” iced teas). Unfortunately, both lemongrass and hibiscus can possibly cause uterine contractions, and so I’ve avoided them in tea/herbal form during pregnancy. Until now! 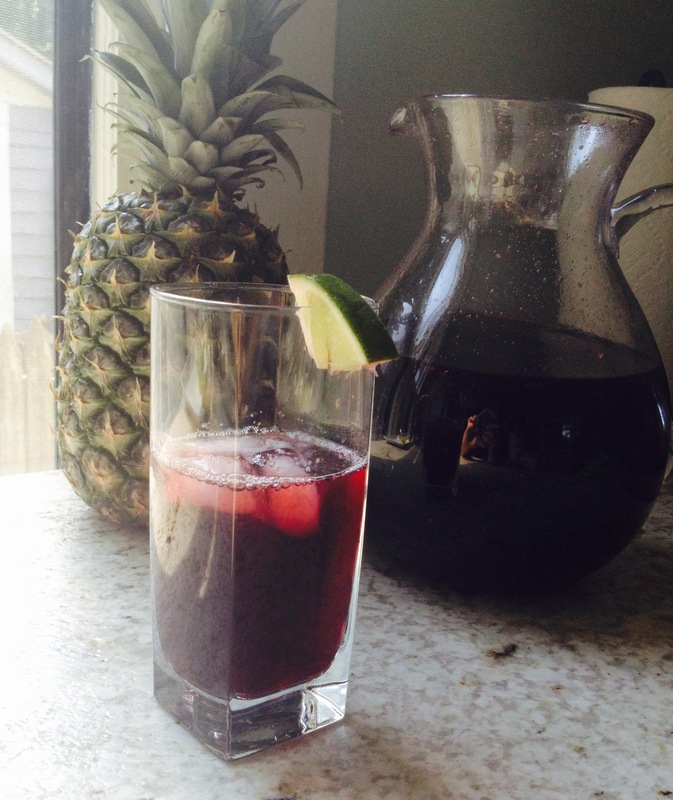 My doula let us know that since I’m 40 weeks, hibiscus could be a safe way to possibly induce labor. I’m skeptical, but who cares–I love it! I like this adapted recipe, but you could definitely add less sugar if you’d like. Taste and sweeten as you like. The ginger adds a really nice Caribbean twist. And happy early Mother’s Day everyone! Pour boiling water over ginger, Jamaica flowers, and sugar, and stir until sugar has dissolved. Let steep 10 minutes. Strain through a fine mesh strainer into a large, heat-resistant bowl or pot. Stir in lime juice and set aside to cool. Refrigerate until ready to use. Serve over ice. K had a four day weekend this week (Ascension day on Thursday as well as a ‘bridging day’ on Friday- companies here realize many people would inevitably take it off, so they give it as freebie – so progressive). Unfortunately, my employer does not celebrate Ascension day or bridge so we stayed in Basel, which was a nice reprieve from our otherwise hectic schedules. Focusing on house projects, we FINALLY BOUGHT A GRILL!!!! Now if anyone knows K, this is a BIG deal in our lives and I must say, I feel more grown up with this purchase than any other we’ve made. As I’ve previously mentioned, Basel is a wonderful place to live; however, the food scene is utterly lacking. Granted, if you hop on a bike and cross the border, you are bound to find incredibly decadent, delicious French food, which we did Saturday night, but if you want anything ethnic, with a hint of heat, we have found the best option is to make it ourselves. As a result, we’ve really expanded our culinary repertoire. We’ve made many dishes where after taking a bite we exclaim – “Wow…is that it? 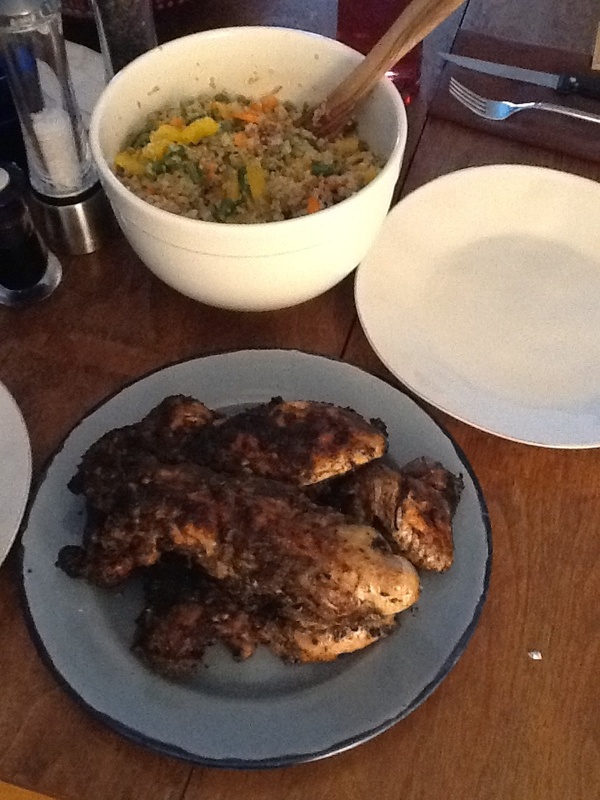 It’s so easy!” So we christened our grill with Jamaican Jerk Chicken (it’s so easy! 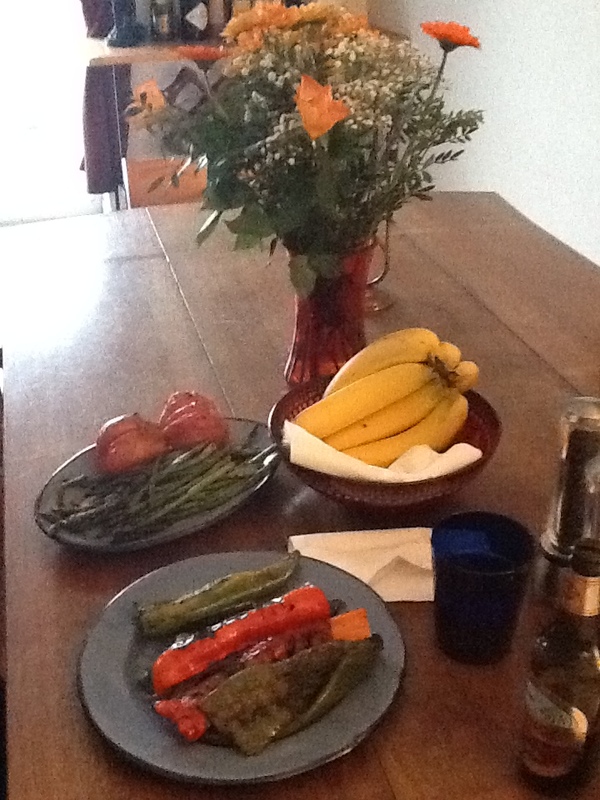 ), parmesan/lemon asparagus and veggies. DELICIOUS. This mix is for one whole chicken deconstructed. Mix all ingredients in a bowl. Rub all over chicken, especially getting into the skin area. 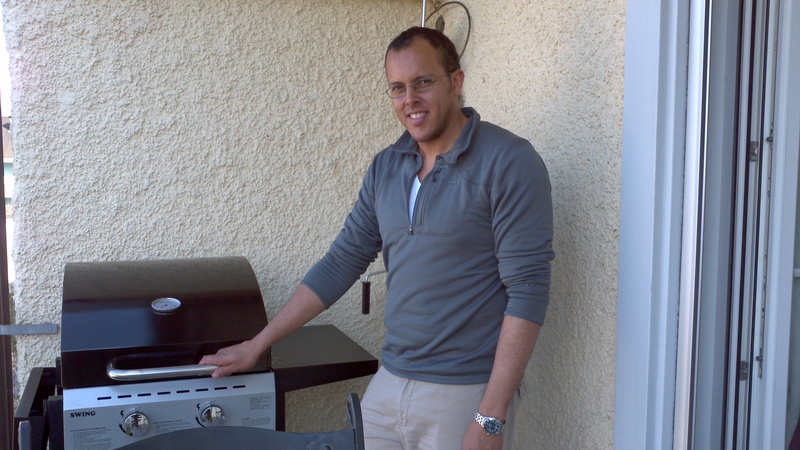 Grill. (Not sure what one is involved here, but I’m sure most people who use one do). If you’ve spent much time in the Caribbean, you realize that you have to be flexible with your cooking. The corner market doesn’t have rice noodles or soy milk, and for that matter, their fridge might quit and rot all produce on the east end of the island. It’s normal for the power to go out for no reason on a sunny day. Or, for example, you realize that almost no one’s stove has a gas line, but is powered like a grill by an external propane tank. And so it’s very likely that you only find the morning of your husband’s birthday dinner that there’s no propane, and that you can’t cook anything on the stove or in the oven. So, I spent my morning thinking of dishes to cook in the microwave (fortunately, the power wasn’t randomly out). Since I’d already marinated some chicken breasts in jerk spice for the grill, I thought hey, why not continue the Caribbean theme, and try to make some peas and rice in the microwave? That’s another thing. If you’ve spend much time down here, you’ve probably had some version of peas and rice before. In the Dominican Republic, the dish is often made with Pigeon Peas–small, circular beans cooked up with white rice and coconut milk. In Jamaica, they’re also often made with kidney beans and with a blazingly hot Scotch Bonnet pepper. And that set of circumstances is how this recipe was born. I really recommend adding the lemongrass if you can–it lends a wonderful citrus taste and makes the rice incredibly fragrant. It turned out great, and in many ways is easier to cook in the microwave than on the stove, so hey, maybe that was all a blessing in disguise. Now that I think of it, I wish I’d known this recipe in college, as it would be great for dorm, microwave-only cooking. Hope you like it. Add the onion and oil to a large microwave safe casserole. Saute for 1-2 minutes on normal power. Add the garlic in and microwave for another minute. Stir in the thyme, rice, salt and pepper, and tomato paste. Add enough water to the coconut milk to add up to 3 cups, and stir it into the rice mixture. Place the whole chili pepper and the lemongrass knot on top. Cover the mixture with lid, or a plate that seals the top of the casserole. Place in microwave, and microwave on high for 10 minutes. Remove the lid or plate and microwave for another 5-10 minutes on 50% until all of the liquid is absorbed. Microwaves differ in their power, so keep an eye out for when the rice absorbs all liquid. Do not stir rice at any time. Taste, and if the rice is tender, remove it from the microwave. Stir in the drained kidney beans gently. Place the lid back on top of the casserole, and let it sit for 5-10 minutes to steam. Serve while hot with plenty of hot sauce on the side. We are in St. John, in the US Virgin Islands right now visiting my parents. In addition to this view, their house is surrounded by some fruit trees, including lots of papayas. Unfortunately, if you leave the papayas on the tree for very long, they get pecked to death by birds, so we usually pick them while they’re green. I’m a som tom (Thai green papaya salad) addict, so we make that a bit, but tomatoes and fish sauce are sometimes hard to come by on island, so I decided to try out something different tonight–Green Papaya Salsa. Our papaya, though green on the outside, was actually somewhat orangey-yellow already, but definitely not ripe just yet. You could even use a ripe papaya for this recipe, but I’m not a huge fan of ripe papayas personally, as I find they get too close to the edge of rotten when ripe for my own taste. It makes sense that green papaya would do well in a salsa, as I’ve had shaved green mango with lime, chili, and salt multiple times as a street snack in Mexico. I would definitely make this one again, and would stick closer to the original recipe if I happened to have good tomatoes and fresh chilis on hand, but this was delicious in a pinch. Enjoy! modified from a recipe posted on Serious Eats and originally adapted from The Culinary Institute of America‘s Techniques of Healthy Cooking. Stir all ingredients together and taste–add more citrus juice or salt as needed. Our jarred salsa was quite salty, but as we didn’t have any good fresh tomatoes on hand, it stood in well for those. Enjoy with tortilla chips, or even better, plantain chips for some Caribbean flair.